A giant Silver Panda. A giant opportunity! Act now for this limited edition Five Ounce 2013 Silver Panda Show Proof! 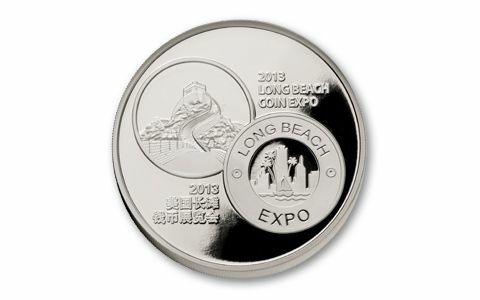 For nearly a half century, the Long Beach Coin Expo has been regarded as one of the preeminent coin shows in America, hosting hundreds of domestic and international dealers. But at last year’s Expo, attendees witnessed what could be a once-in-a-lifetime event: the unveiling of a commemorative silver proof that hadn’t been duplicated in 26 years! 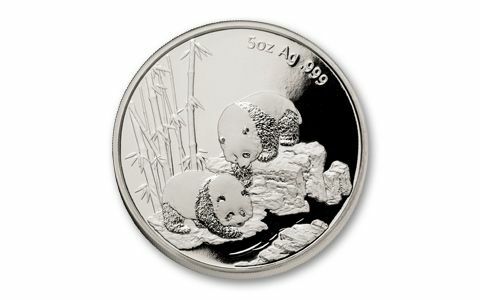 For only the second time time since 1987, the China Mint honored this prestigious American coin fair with a massive Five Ounce 99.9% Silver Panda Proof featuring the official logo of the Long Beach Coin Expo and the Great Wall of China – not to mention two adorable Giant Pandas at play in a bamboo forest. Just 2,500 of these limited edition Silver Panda Show Proofs were struck – 20 times FEWER than the 50,000 standard Five Ounce Silver Panda Proofs the China Mint issued in 2013! It didn’t take us long to figure out that collectors would be in hot pursuit of these giant Long Beach Show Pandas – so we quickly used our status as a China Mint distributor to secure as many as possible. And it’s a good thing we did. Chinese Show Proofs have become an extremely sought-after segment of the collectible market in recent years. And as the China coin market has heated up, so have many of the Panda commemoratives from past coin shows. 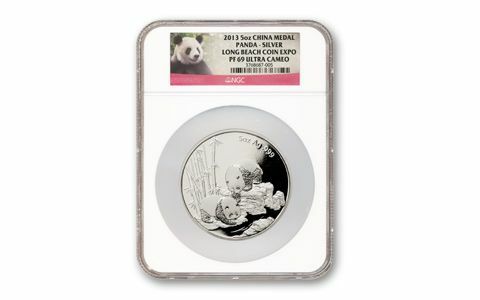 Only the second-ever Silver Panda Proof struck for the Long Beach Coin Expo! Starting with the 1984 Hong Kong International Coin Fair, special "Show Pandas" were issued by the China Mint in recognition of important coin shows around the globe. But a Panda commemorative honoring the Long Beach show hadn’t been struck in more than two decades! It was clearly a giant opportunity! So after securing these Silver Panda Show Proofs, we had them shipped directly to one of the most respected third-party coin graders in the world, Numismatic Guaranty Corporation (NGC). The top grading experts at NGC inspected each and every one– discovering a small number that graded near-perfect Ultra Cameo Proof 69 (PF69 UC)! An Ultra Cameo proof displays the greatest contrast and deepest strike, making it one of the most spectacular and sought-after of all proofs. Only an elite group ever achieve this status! • $2,100 for a Five Ounce Silver Panda commemorating the 1988 Hong Kong International Coin Expo with a mintage of just 1,000! Of course, no one can predict their future value. But savvy collectors are always on the lookout for Proof Silver Pandas in ANY size – and that just makes these massive 2013 Long Beach Show Pandas even MORE coveted! 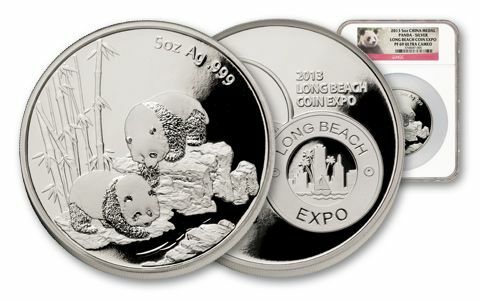 Because the mintage was so limited, our small supply of these Five Ounce 2013 Long Beach Silver Panda Show Proofs is in great demand – and likely to sell out as quickly as many past-year issues! Once they’re gone, it’s doubtful that we’ll ever be able to offer these giant Silver Panda Proofs again. And since no one knows if ANY Silver Panda Show Proofs will be issued in the future, you won’t want to wait to order yours!